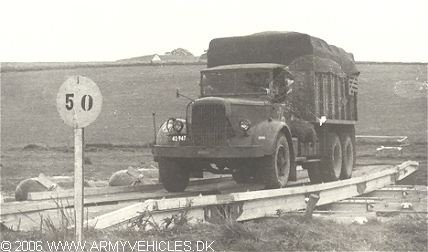 Danish Army Specific: Procured around 1951 via the MDAP. Used for hauling engineer material. Historical: As for the Mack NR-14. The body was all steel with tall sides and rear doors, and more suitable for bulk cargo haulage rather than combined cargo and personnel. As differences between the NR-15 and the NR-16 are scarce, the shown vehicle might be the latter. Engine: Own 6-cylinder (Mack ED), 8.506 cm3 (519 cubic inches) displacement, liquid cooled. Horsepower: 123 at 2.000 rpm. Transmission: 5-speed Mack TRD37 gearbox. Electrical system: 12 volt (24 volt starting). Fuel capacity: 682 liter (150 gallons).